Happiness is an Emergency Power System that Works! Last year was a particularly difficult electric power year for us. In the last 13 years we probably had four outages that lasted more than 24 hours. It happened so infrequently we kept the generator in the back of the barn. Last year we had four 24+ hour outages. The big problem for us is that we get our water from a cistern. That means that we need electricity to pump water. Ten years ago we had a transfer switch installed so we could safely use a generator to power 6 circuits that included the pumps. It was a Generac transfer switch with a double throw switch for each circuit. During the third power outage I hooked up the generator and it immediately tripped the breaker on the generator. My wife decided it must be the generator since our generator was ten years old and went out and bought a new generator. With this new generator we keep it in a much more convenient location to the transfer panel. I can roll out the generator and hook it up to the transfer panel in about five minutes. On December 23rd we had our fourth 24+ hour power outage. I hooked up the new generator and the breaker tripped whenever I tried to turn on a circuit. A circuit providing power to the water was not functioning whether it was connected to the generator or the utility power. Now I knew that the Generac transfer switch had a serious problem. I performed some emergency wiring to get power back to the pump. Two days after Christmas our electrician came out and confirmed that we had a problem with the transfer switch and cleaned up my temporary wiring. Last Friday we finally got our new transfer switch installed. The electrician replaced the Generac unit with a GE Power Transfer switch and a new electrical sub panel. This a more industrial looking solution so I have a warm, fuzzy feeling that this solution will be more reliable. I stayed home on Friday to test the switch and verify that the circuits were working. It worked. I was curious about the price of the transfer switch. I found it at Home Depot and Lowes for $118. This looks like a cost competitive and more reliable solution compared to the Generac prewired solutions. 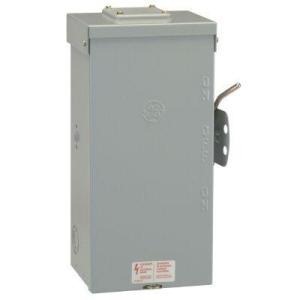 100 Amp 240-Volt Non-Fused Emergency Power Transfer Switch-TC10323R at The Home Depot. This entry was posted in Economy, Electricity, Farm Life and tagged farm life. Bookmark the permalink.